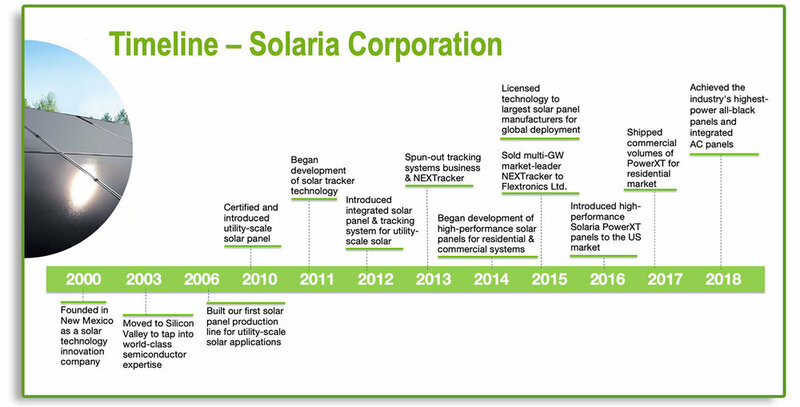 Solaria’s initial technology expertise was in the development of low-concentration-photovoltaics (LCPV). Solaria’s products and technologies were field-tested, certified and productized, with over 30 mega-watts installed in demanding, utility-grade, ground mounted deployments around the world. Solaria became synonymous with field-tested, high quality, durable, high performance LCPV combined with innovative solar tracking arrays. As part of its utility solution, Solaria developed NEXTracker, answering the growing market need for highly integrated and cost-effective tracking systems. Leveraging its depth and breadth in the system domain, NEXTracker was spun-out. Within a year, NEXTracker became the leading independent provider of tracking systems and grew one hundred fold. A year later, Flextronics acquired it for $335M, and it continues the same growth trajectory.